I promised three recipes using my sample stash of cabot creamery cheddar cheese. Earlier this week I posted two other recipes. Wow this has been a busy week here at Nourished Simply! (I usually only manage to post one or two recipes, not three) The other two recipes Cheddar BLT Cups and Philly Cheese Steak Bites of course contained meat. I wanted to make a third appetizer that was meatless. I used the White Oak Cheddar Cheese. Mushrooms are often used as a meat substitute in meatless recipes because of their “meaty” texture. I love mushrooms and make a lot of dishes that include them. Baby Portabella’s have been my mushroom of choice for a few years now. I used to always use white button, but slowly moved away from them. Not that there is anything wrong with white button, but I just made a switch to something different. For this appetizer I used baby portabella’s and cremini mushrooms. The mushrooms need to be chopped very fine in order to fit well in the phyllo bundle. I attempted to use my food chopper, which quickly was abandoned because it pulverized the mushrooms. I only put a handful in the chopper, so the pulverized mushrooms blended in well with the chopped mushrooms. It was a good thought but did not turn out as I had expected. This was the first time I used phyllo sheets. Through researching recipes I continually read that they are very delicate, which made me extremely nervous about using them. 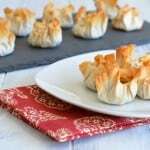 I almost did not make this recipe, because I feared the phyllo! The warnings were no exaggeration. 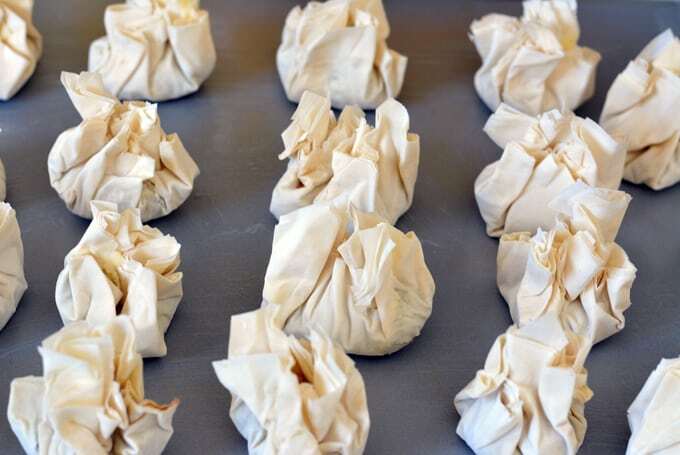 The phyllo sheets were very delicate, however if you take your time you should have not trouble with them. I am always rushing. I was working with the phyllo pretty well until I tried to speed thing along. This is when 2-3 sheets had to be trashed. So take your time and be gentle. I wanted to take pictures of each step to help you through the recipe, however someone (me!) forgot to put the camera card back into the camera. I didn’t realized this until the bundles were ready for baking. 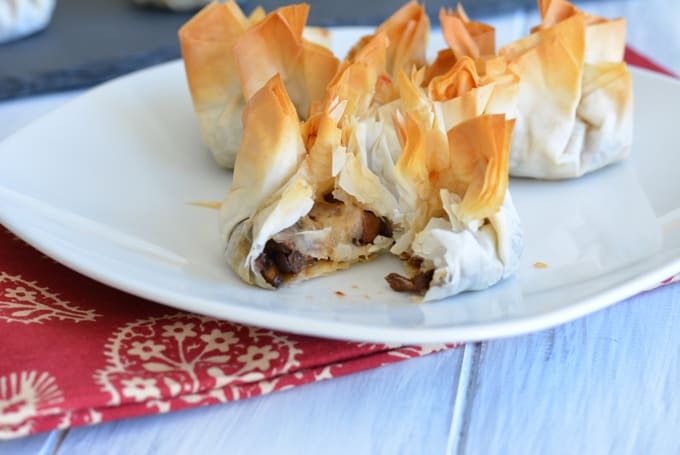 The Pioneer Woman has a great post for mushroom bundles that takes you step by step through using the phyllo sheets, so check that out. Dice mushrooms into small pieces. In a skillet, heat olive oil over medium high heat. Add garlic and shallot, cook for 1-2 minutes. Add in diced mushrooms, stir to mix. Cook mushrooms for 3 minutes, stirring frequently. Combine balsamic vinegar and brown sugar in a small bowl or measuring cup. Add balsamic mixture to mushrooms. Cook until liquid dissolves and becomes a glaze, about 5 minutes. Take 1 phyllo square and brush lightly with melted butter. Place a second phyllo sheet on top of the first and brush with melted butter. Cute this phyllo stack into 4 equal squares. In the center of each square place 1/2-1 tablespoon of mushrooms, and 1/2 -1 tablespoon of cheese. Gently gather the edges of the phyllo around the filling and gathering in at the top, pinching the phyllo closed. Repeat steps until you have made about 20 bundles. Place bundles on a greased baking sheet and bake for 20 minutes or until golden. mmm..these look delish! I love everything with phyllo, but it definitely is an exercise in patience to work with. I have a similar recipe to these bundles using frozen phyllo shells, which is so much easier! 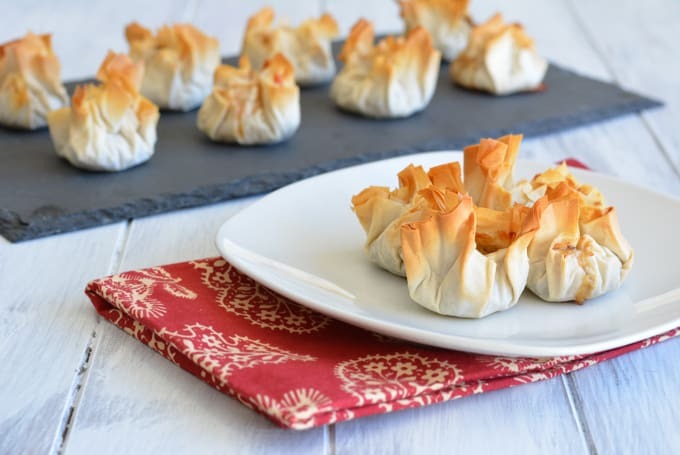 I used phyllo cups for another recipe and they were so much easier. Looks like a perfect combo for me. Those crispy little purses with savory bits inside could be very addicting. It’s easy to eat too many! These bundles turned out so pretty – nice work! The ingredients are my faves – I just love mushrooms, and hellooo cheddar cheese! Thank you. I was really nervous about the bundles opening. These are so fun! I’m obsessed with mushrooms right now so I totally want to go make them.